Learn the Bone block first MTP fusion using the Wright Ortholoc plate surgical technique with step by step instructions on OrthOracle. Our e-learning platform contains high resolution images and a certified CME of the Bone block first MTP fusion using the Wright Ortholoc plate surgical procedure. 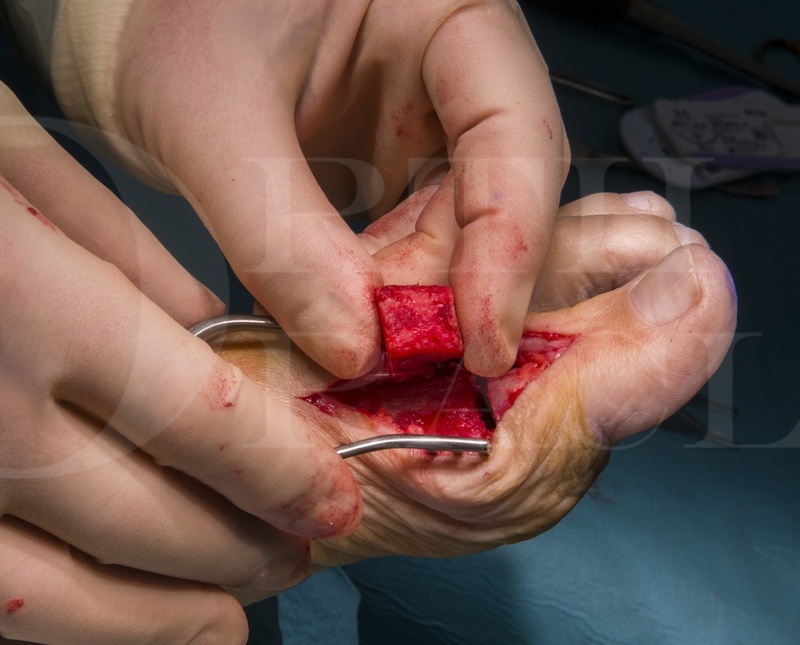 A Bone block fusion has a lower union rate than a direct fusion of the first metatarsal head to the proximal phalanx so specifically is used to regain length of the first ray and not simply for revision cases without bone loss. Its main indication is an iatrogenically short and defunctioned first ray with transfer metatarsalgia . This may be in the presence of a failed MTP fusion, a sound MTP union, an excision arthroplasty of the joint or any form of MTP replacement. The most common indication for a bone block MTP fusion though is after removal of a failed first MTP joint replacement for aseptic loosening or a persistently painful joint replacement. If bone quality is good and there is nothing to suggest an active infective process then the intervention can be as a single stage (though with the usual microbiological long cultures). If there is a probability of active infection then this should be as a two stage operation with a gentamicin cement spacer in situ for 6 weeks between the stages. Fixation should not be with axial screws which will weaken the structural tri-cortical graft but rather an appropriately designed and sized compressive plate that avoids direct fixation into the graft. Institution: The Wellington Hospital ,London, UK.